Rick Harp, host and producer of the weekly Indigenous current affairs podcast, MEDIA INDIGENA, has decades of broadcasting experience, including stints at the Aboriginal Peoples Television Network, CBC Radio and CKCU-FM. A citizen of the Peter Ballantyne Cree Nation in northern Saskatchewan, he now calls Winnipeg home. The many Indigenous lands that have come to be known collectively as Canada over the past 150 years have also been home to a multiplicity of Indigenous languages for thousands of years. Yet despite all the energy invested by settlers to deliberately wipe out Indigenous languages — what some call premeditated linguicide — those ancestral tongues are not yet stilled. Language may not be seen as the most serious issue facing our peoples when so many other problems need to be addressed — poverty, racism and lack of access to water and housing, to name a few — but for Indigenous language activists like Lorena Fontaine, language is a fundamental part of our identities. Of Cree and Anishinaabe descent, Fontaine is a member of Sagkeeng First Nation in Manitoba on her father’s side and Opaskwayak Cree Nation in Manitoba on her mother’s side. While working on residential school claims in the early 2000s, she began to hear that most Indigenous Peoples wanted reparations for the loss of their language and culture — taking away both was among the principal aims of residential schools. Many Survivors were not just interested in individual compensation, they wanted something bigger: to ensure their children and grandchildren would be able to learn their language and practise their culture into the future. However, they aren’t seeing that happen. Like many Indigenous people, Fontaine feels the loss of language at a deeply personal level. Both her parents and grandparents attended residential schools, with her mother being only three years old when she was removed from her community. Unlike many children taken so early, however, her mother remained a fluent speaker of Cree because her parents eventually took her out of school, hid her on the family trapline and made sure she learned and spoke the language. Our languages are integral to who we are. Currently, Section 35 of the Constitution recognizes Aboriginal and treaty rights in a general way. According to Fontaine, before the Constitution Act of 1982 was passed, Indigenous leaders who participated in the constitutional talks intended for this section to cover Indigenous language and cultural rights. In the end, Aboriginal rights were not clearly defined, leaving Indigenous language rights without constitutional protection. That meant the federal government would not be legally required to fund immersion programs. This fuels Fontaine’s fight to get Indigenous languages recognized by the courts, to establish the Indigenous right to relay language from one generation to the next, and to legally require the federal government to provide funding comparable to that of English and French programs. 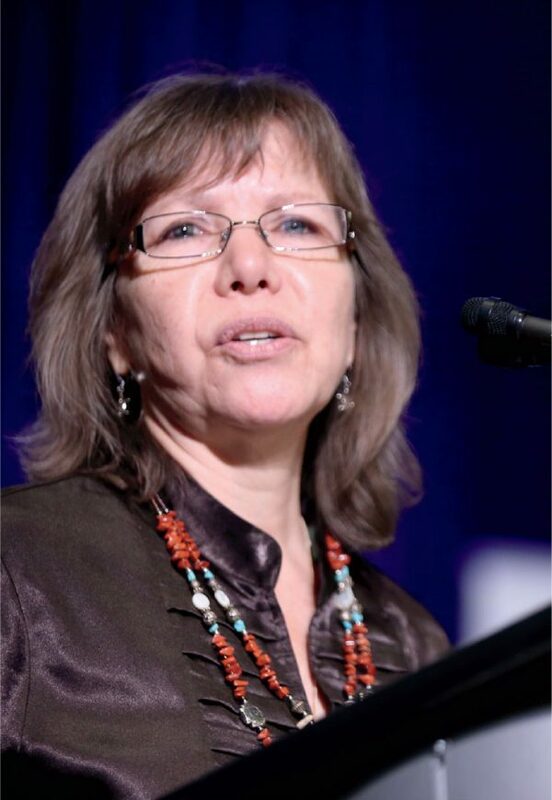 Ellen Gabriel, a Mohawk activist and artist from Kanehsatà:ke, spoke at the United Nations Permanent Forum on Indigenous Issues in 2016 about Indigenous language threats by Canada. The funding provided for Indigenous languages comes out to roughly $2 per Indigenous child, divided among upward of 600 First Nations communities. Fontaine first approached a number of First Nations to see if any would be willing to take up a court challenge around language. Many were interested, but none could afford the potentially massive costs associated with such a case. Then, in 2015, Justin Trudeau was elected prime minister. Fontaine and her colleagues spoke to representatives of his government, who explained that they were supportive of Indigenous rights and would be looking to consult about the most effective ways to introduce federal legislation on Indigenous languages. While such legislation has yet to be introduced, Fontaine and others have their own ideas about what the legislation should include, such as policies enabling children to learn their languages and cultures in school and then creating life around speaking those languages. According to Fontaine, a major focus has to be on supporting teacher training programs, since there is a shortage of Indigenous language teachers. There also need to be guaranteed resources and programs available to any community that requires them. Another key challenge is to keep the language in use. Fontaine has a vision of how that might work: “It’s important to see our communities using our languages in daily interactions — from meetings at the community level to when they pick up milk, they’re using the language. It applies to our laws too,” she adds, “when we talk about governing our communities and the values we want to use, that all comes from our languages.” She argues that educating teachers and creating curricula would create an economy around teaching and learning the language.